The number of vehicles registered in Canada increased 1.8% from 2015 to 33.8 million in 2016. 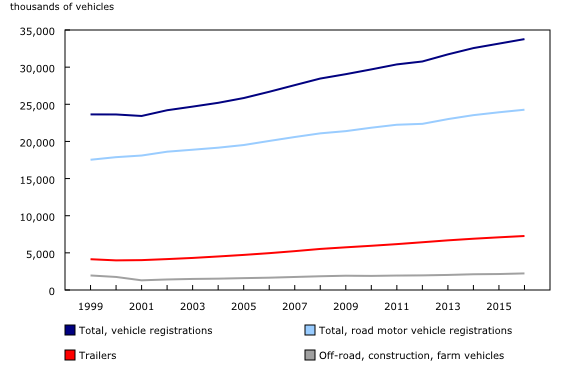 The registrations of light road motor vehicles (vehicles weighing less than 4,500 kilograms) rose by 1.6% to 22.4 million, accounting for 92.3% of the total number of motorized road motor vehicles registered in 2016. The remaining consisted of motorcycles and mopeds (716,000 registrations), medium-duty trucks (590,000 registrations), heavy-duty trucks (463,000 registrations) and buses (91,000 registrations). In addition to these road motor vehicles, 7.3 million trailers and 2.2 million off-road, construction and farm vehicles were also registered. From a provincial perspective, the number of vehicles registered in Ontario reached 11.9 million (up 2.2% from 2015), followed by Quebec (up 2.5% to 8.4 million) and Alberta (up 0.2% to 5.1 million). In 1976, the predecessor to this administrative data program, the Road motor vehicle, trailer and snowmobile registration program, reported that there were 11.8 million registered road motor vehicles, or roughly one vehicle for every two people in Canada. From 1976 to 2016, the population of Canada grew from 23.4 million to 36.3 million. Over that span, motor vehicles grew in importance to Canadian life and industry. The vehicle registrations program in 2016 showed that there were 24.3 million registered road motor vehicles, an increase in the ratio to one registered road motor vehicle for every 1.5 people. Data used in the note in celebration of the country's 150th birthday came from CANSIM tables 405-0001, 051-0001 and 405-0004.